The ancient columns from the Temple of Apollo reach up to the cloudless skies of the village of Riez, Provence in France. The Ancient Columns are all that remains of the Temple of Apollo in Riez, Provence in France, but they still seem to proudly reach up to the sky whatever the weather. The intricate carving of the capitals at the top of the six meter columns appear to be more elaborate next to the smooth granite pillars.Columns of the Roman temple remains, colonnes romaines, from the 1st century near the river Colostre in the village of Riez, Alpes de Haute, Provence, France, Europe. 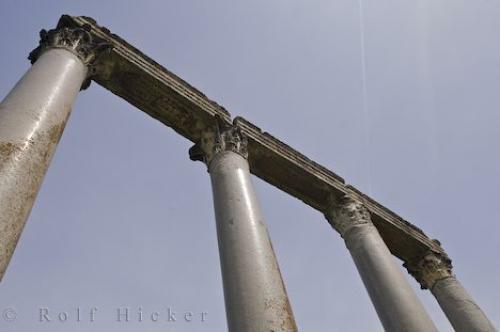 Photo of the Roman columns of the Temple of Apollo in Riez in the Alpes de Haute in Provence, France in Europe.